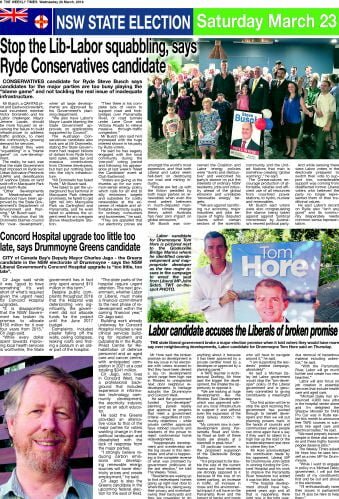 CITY of Canada Bay’s Deputy Mayor Charles Jago – the Greens candidate in the NSW electorate of Drummoyne – says the NSW Liberal Government’s Concord Hospital upgrade is “too little, too late”. Clr Jago said while it was “good to have something” it’s well short of what’s required given the urgent need for Concord Hospital upgrades. “It is disappointing that the NSW Government has broken its promise to allocate $150 million for it over four years from 2015,” Clr Jago said. Despite public complaints throughout 2016 that the Hospital was deteriorating very significantly, the government did not allocate funds for the project until the June 2017 budget. Complaints included plaster falling off the walls, ceiling collapses, leaking roofs and finding a possum in an older part of the hospital. “The older parts of the hospital require urgent attention. The next government, whether Labor or Liberal, must make a financial commitment to the next phase of redevelopment within the coming financial year,” Clr Jago said. Building work already underway for Concord Hospital includes a new clinical services building for inpatient and outpatients in the Rusty Priest Centre for Rehabilitation of defence personnel and an aged care and cancer centre, with anticipated completion in 2021 at a cost totalling $341 million. Clr Jago, who lives in Concord West, has a professional background that includes experience in information technology, community development, the electricity industry and as an adult educator. He said the Greens provided an alternative voice to that of the major parties for voters wanting change in their political landscape and dissatisfied with the lack of response from the major parties. “I strongly believe reducing carbon emissions and developing renewable energy sources will lower electricity prices and create employment,” he said. Clr Jago is also the Greens candidate in the upcoming federal election for the seat of Reid.